Observe your cat and learn their normal grooming behavior. Establish a regular grooming routine (including nail trimming) with each of your cats early in your relationship. This is especially important when you introduce a new cat or kitten into your home. A familiar, predictable routine reduces anxiety for your cat. Remember to be calm, patient, and to stay in control. Catch your cat in the right mood. Cats typically hunt/play → eat → groom → nap → wake → visit the litter pan → repeat. Frequent short grooming sessions are better than infrequent long grooming sessions. Most cats like being combed around the head and neck and find attention to the back legs, under the tail, and belly less pleasing. Work on these less pleasing areas first, and then return to the head and neck to finish on a good note. It may be comfortable for both of you if you work with your cat on a counter facing away from you. You can also sit on the floor with your cat between your legs. On your lap is good for a casual, more intimate session. Reward good behavior. A food treat is one way, but some cats enjoy some extra attention. Work on mats individually. Split them into smaller sections using your comb – untangle from the tips of the fur rather than the base – work with two hands whenever possible using one hand to comb and one to isolate – hold the mat to reduce the tug. Avoid using scissors! It is too easy to cut the skin. If you must, you can use scissors to split the mats if they are especially dense. If mats are too large, too dense, or too close to the skin; shaving may be the only option. Consult your veterinarian for guidance. Consult your veterinarian whenever you notice a change in your cat’s personal hygiene. Appearances matter. Poor grooming can be an early sign of disease. Be sure to always discuss grooming during your cat’s routine physical examination check-up with your veterinarian. Excessive grooming, alopecia (bald areas), and dermatitis (inflamed or damaged skin) warrant a visit to the veterinarian so the underlying problem can be identified and addressed. 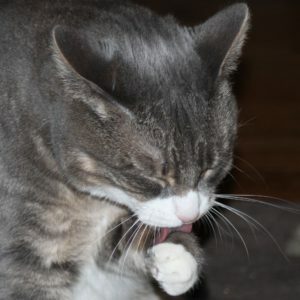 Advanced age, obesity, breed characteristics, chronic illnesses, and /or dental disease may mean that your cat will require some grooming assistance. If your cat is long-haired or overweight, she may benefit from a “sanitary trim” to help them keep the area under the tail clean.